BOSTON, Feb. 14, 2018 /PRNewswire/ -- The Boston Beer Company, Inc. (NYSE: SAM) today announced that it has selected Dave Burwick to succeed Martin Roper as President and Chief Executive Officer. It is expected Burwick will assume the role during the second quarter. Jim Koch will continue in his role as Company Founder and Chairman. Burwick has an established track record of innovation and business success in the beverage and consumer goods industries and has served on Boston Beer's Board of Directors since 2005. In late 2012, Burwick was named President and CEO of Peet's Coffee. Under Burwick's leadership, Peet's has more than doubled its sales and profits over the past five years. Prior to joining Peet's, Burwick served as President of North America for Weight Watchers and in numerous leadership roles over 20 years at PepsiCo, including CMO of Pepsi-Cola North America. "The search committee unanimously agreed that Dave Burwick has the business experience and skills to lead the company forward and will be a great culture fit, appreciating how unique and special Boston Beer is as an organization," said Jim Koch. "We took our time to find the right person with the right intangibles – character, insights, personality and leadership skills." "I'm thrilled to join the Boston Beer team and continue the mission of brewing great beers and winning in the beer and cider categories," said Dave Burwick. "As a Director for over 12 years, I have admired the accomplishments of Jim, Martin and the team, and I share their passion for brewing quality, and their commitment to drinkers, wholesalers and retailers that is demonstrated in everything the company does. 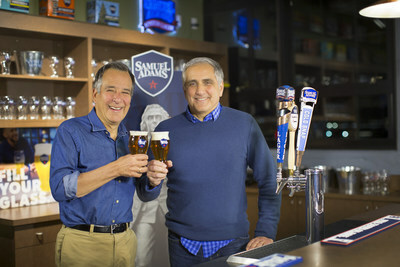 I look forward to leading the team and believe the future is bright for Samuel Adams and all our other brands." Burwick's appointment follows Martin Roper'sFebruary 2017 announcement that he planned to step down in 2018 after leading the company for more than 17 years as President and CEO to explore other opportunities. Under Roper's leadership, the company quadrupled, growing from scrappy up-and-comer to the most successful leader of the Craft beer revolution and a leading player in the hard cider and high-end beer categories. It is anticipated that Roper will resign as President and CEO, and as a Director when Burwick joins the company. "I am grateful for Martin's leadership of the company and his significant contribution to the incredible growth we've seen over the past two decades," shared Jim Koch. "Under his leadership, we were able to maintain our entrepreneurial, innovative culture, while building a highly professional organization. Equally as important as our performance under Martin's stewardship, I am grateful for his partnership and friendship, as we built Boston Beer from the ground up. No company could have had a better CEO than Martin Roper." "I am incredibly proud of everything that the employees of Boston Beer have accomplished over my 23-year tenure and I know that they and our leadership team are ready to work with Dave to continue to build on our current momentum," said Martin Roper. "I am excited to see where Dave will lead the Company." Boston Beer's board-appointed search committee, which included Jim Koch, worked closely with executive recruitment firm, Korn Ferry, to conduct the year-long, comprehensive search that included interviewing and evaluating a broad spectrum of quality candidates.